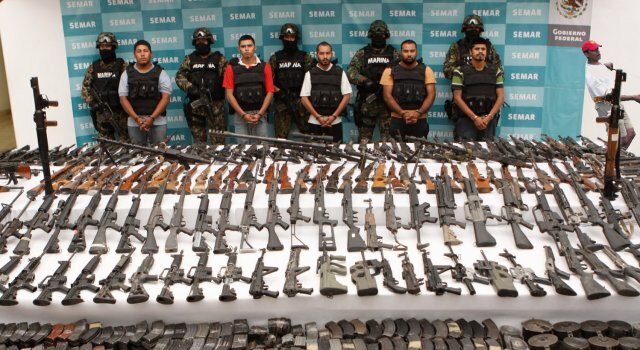 Last week, Carmen Álvarez Excelsior wrote a report for Salem-News.com claiming the notorious drug gang Los Zetas will attempt to overthrow the Mexican government next year using weapons sent by the United States. Excelsior said the brutal gang uses an airport in Fort Worth, Texas, to fly the weapons into Mexico. Rejón Aguilar, one of the original seven members of Los Zetas who was recently captured by police, told Mexican officials the gang bought guns directly from the U.S. government under its Operation Fast and Furious. Excelsior reported that military-grade weapons are also brought into the country through the El Paso-Ciudad Juarez and Palomas-Columbus border crossings. “Many of the weapons have been stored in safe houses. I think Los Zetas are storing them for the upcoming elections of 2012,” said Robert Plumlee, a former CIA pilot who testified before Congress on drugs and weapons trafficking. Phil Jordan, former director of the DEA in El Paso, corroborated the report. He said that the weapon stockpiles including anti-aircraft missiles are transported from a Dallas-Fort Worth Airport. The drug gang had set up front companies to buy weapons directly through a State Department program. The items smuggled into the country from Fort Worth allegedly include grenades, grenade launchers, antiaircraft missiles, body armor, radios, GPS devices, night vision binoculars, and other items. The Small Arms Survey of 2011 issued by the Institute for International and Development Studies in Switzerland reports that Mexico is the number one importer of RPG’s and “under-barrel” grenade launchers. Mexico imported 429 units followed by Latvia with 250. According to the U.S. Border Patrol, Los Zetas has bought a number of properties on both sides of the border and use the locations as weapon stockpiles. The plan by Los Zetas to overthrow the Mexican government was revealed in a report two weeks ago by the El Paso Times. Jordan and a former CIA pilot, Robert Plumlee, told the newspaper Los Zetas transported weapons to El Paso-Ciudad Juarez and the Columbus-Palomas border areas to reinforce their troops battling competing cartels and possibly disrupt the 2012 elections. Mexico’s drug gangs are financed in part by international bankers. During a trial last year in U.S. federal court, it was discovered that Wachovia (now owned by Wells Fargo) bought planes that shipped cocaine. The bank also laundered $378.4 billion in drug money. “Wachovia’s blatant disregard for our banking laws gave international cocaine cartels a virtual carte blanche to finance their operations,” said Jeffrey Sloman, the federal prosecutor in charge of the Wachovia case. In addition to smuggling guns into Mexico, the U.S. government has worked closely with the drug cartels for years. According to court papers filed with the U.S. District Court for the Northern District of Illinois in Chicago, the son of a top-level Mexican drug kingpin worked for the U.S. government. Jesus Vicente Zambada Niebla, the son of Ismael “El Mayo” Zambada Garcia, one of the top kingpins of the Sinaloa drug-trafficking organization, worked as an asset for the United States. Niebla is connected to the Gulfstream II jet that wrecked with four tons of cocaine on board on September 24, 2007. European investigators linked the plane’s tail number, N987SA, to past CIA “rendition” operations. The bill of sale for the Gulfstream jet, sold weeks before it crashed, listed the name of Greg Smith, a pilot who had previously worked for the FBI, DEA and CIA.